"While working in the office today [Ash Wednesday], I have fielded many phone calls wondering, well, I know what they mean is "when is Mass today." How they word it though, is fascinating..."When can we get ashes today? ""Are you offering a service with ashes tonight?"etc... (I wish I could remember more specifics) Not a single: "what time is Mass today?" I've heard or read it said somewhere, that aside from Christmas and Easter, the other favorite times for Catholics to come to Mass is Ash Wednesday and Palm Sunday...because they "get something. 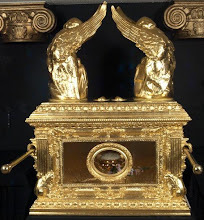 "(also, of course, the reason that so many people in poorly-catechized churches leave right after receiving Communion...because, well, they've "gotten" something, so therefore they must have fulfilled their obligation!)" What an interesting observation - I knew Ash Wednesday was up there with Christmas and Easter, but I had not thought of it in the context of "getting something." 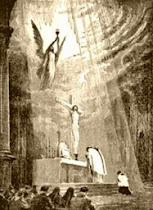 It demonstrates the backwards mentality so many people have about Mass; Mass is about what I get out of it, not about worshiping the Triune God who is all good and all deserving of my love, as the Act of Contrition says (not that folks who only come to Mass once a year to "get ashes" would know the Act of Contrition prayer, with all likelihood), let alone understanding the true meaning of Ash Wednesday as remembering our own mortality and initiating the period of penitence that we will extend throughout Lent, as exemplified in the prayer, "Remember, O man, thou art dust, and to dust thou shalt return." 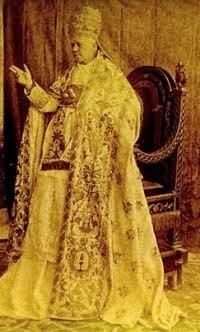 Still, it is an interesting testimony to the enduring power of Catholic customs. Ancient church historians relate that Julian the Apostate, though a professed enemy of Christianity, still made the sign of the cross when he was frightened. Others have noted that certain customary actions, such as men removing their hats when inside a church, persist long after faith itself has vanished. 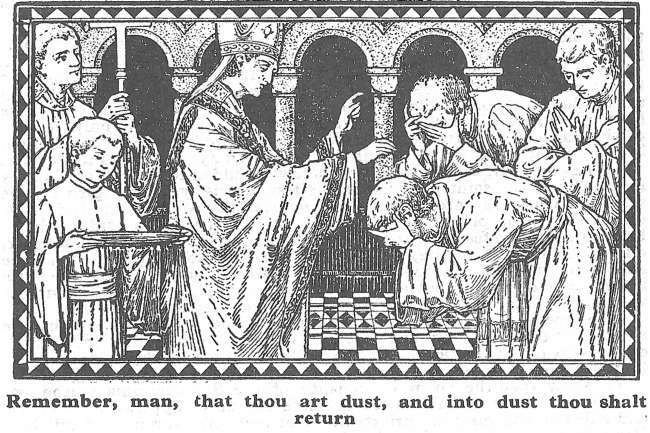 There is a certain durability about Catholic traditions, and the continued popularity of Ash Wednesday is evidence of this. Knowing this, of how much more value could these sorts of customs be if joined to solid Catholic preaching and faithful observance on the part of Catholics? Let is start with us. Please click here to see my latest article on Medjugorje over on Athanasius Contra Mundum, where I take up the oft-repeated statements of the Medjugorje enthusiasts that John Paul II approved of Medjugorje or believed in it privately. The main premise of the book: God is a pacifist (neither using nor sanctioning violence). The secondary premise: all three of the main families of atonement theories depend upon divinely sanctioned violence. Conclusion: therefore none of them are true. A "Narrative Christus Victor" theory of the atonement is then proposed as an alternative. Pacificsm is taken as a premise with very little discussion or argument. I disagree with the premise, and therefore it is tempting to throw the book out without further discussion, but I'll grant it temporarily for the sake of argument. The secondary premise is more interesting. 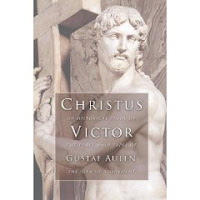 The author follows Gustaf Aulen's distinctions between three main families of atonement motifs: (1) the classical Christus Victor motif, in which Christ's death is the ransom price paid by God to the devil; (2) the satisfaction motif, in which Christ's death satisfies the requirements of God's justice thereby allowing us to receive His mercy; (3) the subjective / humanist moral influence motif, in which the death of Christ is a demonstration of God's love for us, and an example of a moral life and death. The moral influence motif is dismissed without very much discussion on the grounds that it clearly envisages Christ's death as intended by God in order to catch our attention, which is contrary to His pacifism. The classic Christus Victor motif receives a reworking in order to eliminate any trace of Christ's death being intended by God, which is clearly the case in the classic versions of the theory, e.g. where God offers Christ's life as a ransom for the lives of sinners, or where Christ's humanity disguises his divinity as bait on a fishhook - when the devil takes the bait, he can't stomach the divinity and disgorges sinners along with Christ. What Weaver tries to save from this theory is the element of conflict with evil, but here Christ came simply to resist evil by nonviolent means in order to teach us nonviolent resistance to the forces of evil in the world; he knew that he would probably get killed in such a mission, but in no way was it intended as such. 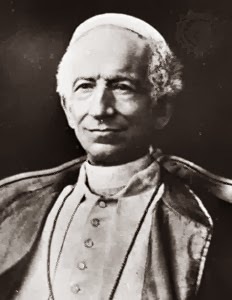 His death was no more planned, although it was foreseen as a possibility, than were the deaths of the North American Jesuit martyrs (my example, not his). "Make no mistake about it. Satisfaction atonement in any form depends on divinely sanctioned violence that follows from the assumption that doing justice means to punish"
This is where it becomes interesting to me. Although I don't agree with pacifism as a general principle, I do that violence against an innocent man is unacceptable. So practically, we are in agreement that divinely sanctioned violence against the spotless lamb of God is inadmissable. The author is also correct in his assertion that the assumption "doing justice means to punish" leads to a reprehensible doctrine of satisfaction atonement involving just such divinely sanctioned violence. 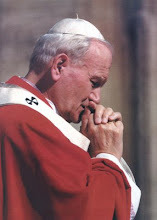 However, his crucial mistake is to pin this assumption on all proponents of the satisfaction theory, whereas in fact it is the specific difference between Anselmian (Catholic) and Calvinistic (penal substitutionary) satisfaction theories that the former do not make this assumption whereas the latter do. In point of fact, it is quite ironic that for all his justified criticism of this assumption, it is precisely his own inability to understand justice in any other way which leads him to miss the difference between the Anselmian and the Calvinistic doctrines. To be fair, he points out repeatedly that the gross emphasis on divine punishment is characteristic of the Protestant development, whereas it is not emphasized at all in Anselm himself. Ultimately, however, he can only regard this as a matter of emphasis rather than a real difference, precisely because of his own assumption that Anselm, by speaking about justice being satisfied, must really mean punishment. Rather than seeing another way in which justice can be satisfied, i.e. by a compensatory gift, the author simply abandons justice and leaves it unsatisfied, beated down, as it were, by God's mercy, instead of working in harmony with it. The specific brilliance of the Anselmian doctrine is that the scales are rebalanced not in that God repays us (represented by Christ) in kind, but in that we (represented by Christ) repay God. Christ offers his own infinately precious self as a gift which is more pleasing to God than all our sins are displeasing. That this gift of himself took the form of death does not mean that it is death precisely as such that God is pleased with. It was rather the perfect expression of love that goes all the way "to the end" (Jn 13:1). Aside from the general argument, there are a number of problems with the author's presentation and argumentation in regards to various details. 1. He proposes as a criticism of satisfaction theories of atonemant that sinners are quite passive in the whole process. Justice is satisfied quite apart from anything we do, and this leaves us with the problem that the atonement seems not to have immediate ethical implications. I would note in return that this surely applies to the penal substitution doctrine, and it is no coincidence that this doctrine is found together with justification by faith alone, apart from good works. The Catholic doctrine of satisfaction depends upon our incorporation into Christ, with all the ethical implications of being fully identified with Him. 2. Weaver writes, "Stated in oversimplified fashion, the pre-Constantinian church looked to Jesus the Lord as the norm of faith and practice... On the other hand, the emperor symbolied the empire. 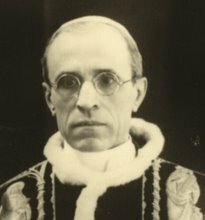 Once Christianity became the religion of the empire... preservation of the empire or the institution of the social order became the decisive criterion for ethical behavior, and the emporer or ruler became the norm against which the rightness of a behavior such as killing or truth-telling was judged" [pp. 84-85]. This is a shockingly false historical analysis, especially in light of the famous confrontation of Emperor Theodotius and St. Ambrose of Milan. 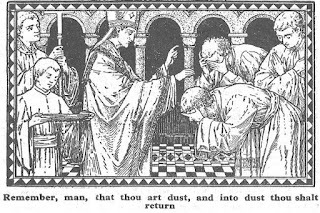 Anselm says (as summarized by Weaver): It is not fitting for Got to remit sin by mercy alone, without any payment for the honor taken away from him; to remit sin in this way is the same thing as not to punish it; and since to deal rightly with sin without satisfaction is the same thing as to punish it, if it is not punished it is remitted irregularly. Weaver concludes: "This means that satisfying sin is equated with punishing it..." "Anselm thus considered the punishment of sins necessary." Although he admits that Anselm never actually says that Christ's death is a punishment, and so he agrees that the blame for the worst excesse of penal substitution (e.g. "divine child abuse") belongs to the Reformers (especially Calvin). I conclude: Anselm says that if God forgives without satisfaction (payment), this is unfitting; to forgive without satisfaction is the same as to forgive without punishment (this is where Weaver jumps in and concludes that for Anselm satisfaction = punishment; it is possible, however, to understand Anselm as saying that forgiveness without satisfaction is the same as forgiveness without punishment inasmuch as in either case justice seems to be lacking); but then in the last line of Anselm's reasoning here, he says that where there is not satisfaction sin is dealt with rightly (justly) by being punished. It would seem then that where there is satisfaction, sin may be dealt with rightly without punishment. Further on, he repeats this misunderstanding of Anselm: "the punishment of death pays the debt that balances sin and restores order" [p. 201; cf. 202]; in fact, however, payment of a debt(satisfaction) renders debtors prison (punishment) unnecessary. In conclusion, I agree with his criticisms against satisfaction atonement precisely insofar as they are directed at the penal substitution doctrine, but I hold (surprise!) that Anselm's doctrine completely escapes his criticisms. From this standpoint, his pacifistic alternative proposal is both unconvincing and unnecessary. I had a hard time describing this event, but you can actually see it on this video at 2:30-2:34. Pay attention for it. I am so saddened by this approach to Catholic Youth work, because there is such a richness in Catholic spirituality and tradition that kids are not being given -instead they are getting emotional Protestantism, pure and simple. They are being robbed: they come looking for bread and are given a scorpion. I've often considered founding my own Catholic Youth organization to provide some sort of alternative to what is offered by NCYM. I think it would take off. Well, I'll get around to it as soon as I can. Right after I finish my two novels, run for State Legislature, get my MA, finish producing my homemade TV series, record that CD I've been saving up for and tie up a few other minor projects on my To-Do list. Anybody who has read secular history books knows how horribly biased they can be with issues regarding Christianity and Catholicism in particular. Sometimes, I even notice that a historian who is otherwise excellent in his respective field suddenly blows it and gives way to the most gross absurdities when treating the Catholic Church. 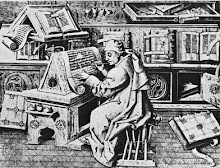 It is as if when one talks about Catholicism, there is no need for scholarship anymore - simply reciting the same tired old fables and prejudices suffices. This bias has understandably provoked a reaction in the Catholic world and the subsequent publishing in the last few decades of a large number of works on history by Catholic authors, many written for children as part of homeschooling programs. My wife and I have been homeschooling for four years now, and only in the past two years (as my eldest daughter is going on 7) have we really got into teaching history. We have primarily been using Seton, but also other companies as well. Without singling out any publisher, I have to say that my wife and I are very upset at the quality and tenor of the history books from Catholic publishers. I've seen them all for every age group and publisher. I've seen Seton, the Didache series, the Ignatius Faith & Life history book, the stuff put out by Memoria Press, the Carroll's books and lots of the old stuff from the 1940's that is currently being reprinted. While some of it is good (I think the Memoria Press history books are pretty solid), the vast majority of them take what I feel is a faulty approach to history. I know that secular history books tend to ignore the Church and its contributions. But then in the Catholic books I get, the pendulum goes too far in the other extreme: the Church and the saints are often the only things covered, as if history consisted of nothing other than the development of the Church and the lives of different men and women of faith. I am certainly not against publishing books about Church history and saints' lives - believe me! But what I am against is marketing a book as "American History" and then finding out that it is only a history of American saints and the Church in America. That is an important element of American history, but it is not American history. My daughter has a history book which purports to be about American History but it does not mention the Civil War, except for a passing reference to it regarding a nun who worked as a nurse in the War. I don't think it mentions the Revolution, either. 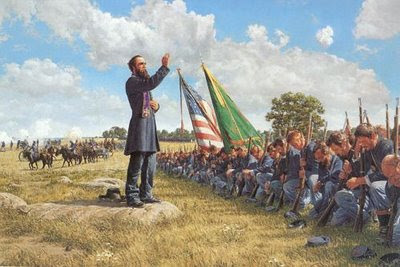 We want to emphasize the Catholic presence in history, but for crying out loud, how can you leave the Civil War out of a textbook on US History, even if it is for a third grader? Listen, when we study history, we are studying (by and large) the particular and the secular. We are studying the rise and fall of kingdoms, wars and battles, eminent men and women and important discoveries and innovations. Sometimes (often) the Church is part of that story - often times it is not. There's a lot of history that happens that has nothing to do with the Church but is nevertheless very important, and you can't just leave that stuff out or treat it like it is incidental to Church history. The books I see tend to treat all history as if it is a department of ecclesiastical history. Church History should be a separate course of study from mainstream history, or if it is integrated, it should not completely supplant profane history. Anybody who studies Church history even for an hour knows that the profane and the sacred histories are so intertwined that you can't parse them out and really grasp one without reference to the other - well, maybe you can in the modern world, but certainly not in the Middle Ages. Church history is very important, but I don't want my kids to just be reading hagiographies and Church history and think they are getting the whole historical picture. I think the ideal is to teach secular history with ecclesiastical history mixed in as the crowning jewel of the world's history. In this sense I appreciate the approach taken by the Carroll's, but I still think their writing tends to overemphasize the ecclesiastical element. Okay. Had to get that out of the way. Sorry. No, it is not the name of the latest Christian heavy-metal band, but it is a concept that I did a little study on this past week with some fascinating results. "I will put enmity between you and the woman, and between your offspring and hers; he (she) will crush your head, while you strike at his heel." A fascinating thing about the Old Testament is that almost every time a heroine is raised up for Israel, she triumphs over her enemy by in some way destroying his head, beautifully and morbidly fulfilling the prophecy that the Woman would triumph over the devil by destroying his head. Then Deborah said to Barak, "Go! This is the day the LORD has given Sisera into your hands. Has not the LORD gone ahead of you?" So Barak went down Mount Tabor, followed by ten thousand men. At Barak's advance, the LORD routed Sisera and all his chariots and army by the sword, and Sisera abandoned his chariot and fled on foot. But Barak pursued the chariots and army as far as Harosheth Haggoyim. All the troops of Sisera fell by the sword; not a man was left. Sisera, however, fled on foot to the tent of Jael, the wife of Heber the Kenite, because there were friendly relations between Jabin king of Hazor and the clan of Heber the Kenite. Jael went out to meet Sisera and said to him, "Come, my Lord , come right in. Don't be afraid." So he entered her tent, and she put a covering over him. "I'm thirsty," he said. "Please give me some water." She opened a skin of milk, gave him a drink, and covered him up. "Stand in the doorway of the tent," he told her. "If someone comes by and asks you, 'Is anyone here?' say 'No.' " But Jael, Heber's wife, picked up a tent peg and a hammer and went quietly to him while he lay fast asleep, exhausted. She drove the peg through his temple into the ground, and he died. Barak came by in pursuit of Sisera, and Jael went out to meet him. "Come," she said, "I will show you the man you're looking for." So he went in with her, and there lay Sisera with the tent peg through his temple-dead (Judges 4:14-22). Most blessed of women be Jael, the wife of Heber the Kenite, most blessed of tent-dwelling women. He asked for water, and she gave him milk; in a bowl fit for nobles she brought him curdled milk. Her hand reached for the tent peg, her right hand for the workman's hammer. She struck Sisera, she crushed his head, she shattered and pierced his temple (Judges 5:24-26). Next Abimelech went to Thebez and besieged it and captured it. Inside the city, however, was a strong tower, to which all the men and women—all the people of the city—fled. They locked themselves in and climbed up on the tower roof. Abimelech went to the tower and stormed it. But as he approached the entrance to the tower to set it on fire, a woman dropped an upper millstone on his head and cracked his skull (Judges 9:50-53). Of course, we cannot forget Judith who defeated Holofernes, who "smote twice upon his neck with all her might, and she took away his head from him" (Judith 13:8). Also Esther, who through her intercession exposed the wickedness of Haman and caused him to be hung from the neck until dead - another death involving the head. These verses provide a beautiful typological reason to see our Lady in the Protoevangelion, and are excellent biblical references to explain to Protestants how our Lady has a role in the salvific plan of God. Let these examples serve to show that God really does fulfill His prophecies, sometimes right down to the minutest and most morose details! Has everybody noticed how in the past three months the liberal media elites have suddenly stopped talking about global warming and started calling it climate change? I'm guessing this is a subtle way to distance themselves from a discredited scientific theory that many in the future will be embarassed about believing in now. People are amazed at the panic and fear-driven decisions that seem to be plaguing Wall Street and the Federal Government, but I think I've never seen a more panic-driven, irrational movement than that fostered by the insane promoters of the move to Green everything, even if it means taxing people into oblivion to reduce illusory "carbon footprints" by degrees that won't matter for centuries. 1) Colonize Greenland: How tantalizing you are up there on the mercator projection, you giant massive bulk of land that nobody can live on! How you taunt us by being named Greenland but being a frozen waste! What a wonderful benefit to humanity if this bulk of useless ice could be dethawed and made fit for human habitation. The same could be said about the Northwest Territories and other areas of the far north devoid of any significant human populations. For liberal types who are afraid of overpopulation, this should be a happy prospect! 2) No more Michigan winter: For those of us who suffered through winter in the midwest, or the Great Plains, and are still enduring the frigid temps of December and January despite the fact that its almost March, cries about the dangers of global warming are met with icy indifference (pardon the pun). Right now in Michigan, on February 20th, it is still in the single digits, everything is covered in miserable ice, and winter is clinging to life as long as it possibly can. It will drag on into March, too. We won't see any appreciable warmth until late March. With the way the winter here destroys our roads, wastes our salt reserves, demoralizes those forced to live and work in it, raises Natural Gas bills to absurdly high levels and preys on the homeless, nobody here will care about some global warming. In fact, I could go for some global warming right about now, and anybody who had the nerve to turn up in the middle of this freeze and warn us about the dangers of a heating planet would probably be lynched (and rightly so). 3) And end to the pernicious polar bear: How long will humanity suffer from that perennial scourge of nature, the polar bear? How many men have to die, how many farms be destroyed, how many cities levelled by this beast until it is brought into subjection? Now that we have a real chance to destroy the evil polar bear by melting his ice floes, we ought to take it. Remember, when it comes to polar bears, there is only one rule: kill them - before they kill you. 4) Justification for more government waste: Finally, the best thing about global warming is that it will give great cause for our responsible, accountable, transparent government agencies to dump billions upon billions of dollars (which nobody really needs anyway) into another wasteful and useless enterprise. Isn't that lovely? In conclusion, at least with regards to point one and point two, I say everybody light up your cigarettes, run your cars in the driveway for an hour purposelessly, go spray so aerosol into the sky, and enjoy the farts of your cows. In this final post on the command of God to Joshua to exterminate the Canaanites, we will look at the moral culpability of those involved in the slaughter of the Israelite conquest. As odd as it sounds with such subject matter, I have thoroughly enjoyed thinking through this complex and important biblical issue, and I think I have done so without going into heresy! I do not put forward my opinion as the only allowable one on the issue, but I do think it is pretty good as it preserves the goodness of God, the inspiration of Deuteronomy, the reality of the Canaanite genocide and the justification of the Israelites who faithfully obeyed God's commands. For those who have accepted (as I do) the simple biblical reality that God did indeed command the genocide, we come to a serious dilemma. 1) It is always wrong to kill an innocent human person. 2) God commands the killing of innocent human persons. 3) Therefore, either God commands what it evil and is not therefore good, or else the killing of innocent persons is not evil, which we know to be false. If killing innocent people is sinful, how can God command what is sinful? Furthermore, this puts the persons involved in a terrible dilemma: if they obey God, are they guilty of the mortal sin of murder? But if they disobey God, do they incur the wrath of God for disobedience? What exactly is the culpability of those involved in carrying out God's decree of destruction against the Canaanites? I think we have to step back and look at why killing is wrong. Murder is clearly prohibited by the fifth commandment. But why is murder wrong? Because it is the taking of a human life. Okay, but what is it about the taking of a human life that makes it sinful? God takes human life all the time. He sends or allows car accidents, heart attacks, sometimes smites people, in the Old and New Testaments (remember Uzzah and Ananias?) and has some devoured by wild beasts or taken in plane crashes, all of which He either permits or directly causes - and He does directly kill people at times, as He plainly tells the Israelites in Exodus where He warns against taking advantage of the widow and the orhpan: "My anger will be aroused, and I will kill you with the sword" (Ex. 22:24). Scripture seems to say that the prerogative of taking a life belongs to God alone: "See ye that I alone am, and there is no other God besides me: I kill and I make to live: I will strike, and I will heal, and there is none that can deliver out of my hand" (Deut. 32:39). I'm not sure how this is worked out through the principle of secondary causes working within Divine Providence, however. But this verse brings us to the point of why killing is wrong: since God kills, we have to infer that killing a person is only wrong when done by another person. The reason killing is so heinous is because only God knows when a man's allotted time on earth is over and can cut the thread of life. If anybody other than God presumes to take life, they take unto themself the power of God. This is not to minimize the true human tragedy of losing an irreplaceable person to death - the element of the sin which is based around the robbing of the world of another life. However, fundamentally, I think if we see murder within the context of the Old Testament and God's relation to His people, it is primarily a property issue. Humanity and human life are God's alone to give and take, and when we assume the right to do so on our own, we are robbing God of His prerogative. Even worse, we are acting as though we were God, not only knowing good and evil (as the serpent promised), but deciding when to give and take life. So then it is always wrong to take life because we never know when a person's time is up and we cannot take upon ourselves the role of God in deciding these matters. But what if God Himself tells you authoritatively that a person's time is up and orders you to take their life as His instrument? Of course, I am presuming that we all understand that in accordance with Divine Revelation God would never tell anybody this now - I am referring this question solely to Old Testament times and to instances recorded in the Scriptures, so don't send me a bunch of comments saying, "But Boniface, there are a whole bunch of nuts throughout history who thought God commanded them to kill." Understood. But I am not talking about them, only those few instances recorded in the Sacred Scriptures. Everybody got that? At any rate, we would have to admit that knowing what we know about why killing is wrong, these factors become a non-issue if God is commanding the killing. I can't kill because the power to kill belongs to God alone. But God says, "I, the Lord over life and death, command you to take such-and-such a life and give you my authority to do so." I can say also that God alone knows when a person's time is up; this is not something I can decide. But God says, "Their iniquity is complete and the time for their destruction is at hand." Therefore, the very factors that make murder a culpable sin are negated when God commands the killing and invests someone with His authority to carry it out. Two examples. We understand that a private individual cannot kill another person (save in self-defense), and that even if a criminal were found guilty of a serious crime and merited the death penalty, still a private individual could not execute this penalty upon the wrongdoer. Just because somebody is guilty doesn't mean I can just kill them. However, God has delegated the power to take life to the state, as sanctioned in Romans 13. Therefore, this is one situation where God says, "I give you power and authority to take human life" (provided it meets certain criteria, of course). Another example is the sacrifice of Isaac. Murder is always wrong, but human sacrifice is deplorable. And yet God commands Abraham to commit human sacrifice, and Abraham instantly obeys, even though it is precisely because of human sacrifice that the Canaanites are being reserved for judgment from the time of Abraham to Joshua. Of course, Isaac was not actually killed, but Abraham had no idea that God would intervene and he intended to go through with the action till its completion. And the Scriptures commend Abraham for his faith in doing this. The lesson of this is that when God commands something it is to be obeyed: it is a matter of authority. All our human categories about what is right and wrong break down when God is the one commanding it, and obedience to these commands is considered faith. If one reads Judges and the last portions of Joshua, you will see that the Israelites are actually chastised by God for not taking the genocide far enough. Now be careful here: I am emphatically not saying that God is not good, or that He is arbtitrary. I am not saying that God can command what is wrong - I am saying that what God commands is always right, even if it is genocide: but the only reason God can command genocide and it be right is because He alone has the authority to dispose of life as He wills and He alone knows the appointed time for each person's death. Therefore, it falls within His rights to order genocide if He wants and we must regard the obedience of the Israelites to this not as sinful but as obedience to God - an obedience which is meritorious and which the failure of (as we see in Judges, for example) is blameworthy. Murder is always a sin, but murder consists of man killing another man of his own will. God telling you to kill somebody else cannot be said to be murder in the strict sense. As strange as it sounds, then, I must conclude that theologically speaking, the Israelites are not committing the sin of murder in the proper sense when they kill the Canaanites. They are killing, but killing with God's sanction, which He can give if He wills. Ultimately, I think no other explanation will suffice other than finally agreeing that if God said it, it must be accomplished in obedience and that we can have faith (the implicit faith of Abraham as he raised the knife over Isaac) that what God commands is always right because He commands it. Click here for part 1 and part 2 in this series. This will blow your mind. We need to do something about this. First, click on this link and read this short article from the Daily Nebraskan. Make sure to leave a comment in the combox. Third, somebody send the link of this article to Fr. Z to get his commentary on it. Fourth, forward this stupid letter to everybody you know and encourage them to complain about it. People can't continue to get away with saying such stupid things in public. I emailed Mr. Citta and told him he was lucky Catholics were so "indulgent" (yuck yuck) with people who attack our faith- try writing something like that about Muslim tradition and see what happens! In this post we will continue looking at the genocide commanded by God in Deuteronomy 7 and look at how God can command something that the Church teaches is intrinsically evil and whether those who took part in the killings are guilty of serious sin. Before we get to the text, we have to clear up a few things from the last post. [I]f God clearly "willed" the stopping the Nazi war machine, that He also "willed" the horrific carpet-bombing of defenseless civilians in Germany as a deliberate act of mass terror as a"means" to accelerate the achievement of his primary objective regarding the Nazis? I need to qualify this statement in two respects: first, when God wills something and wills the means to that end, if human beings are the agents of this actions then the means obviously must be in accord with what is Good and True. So if God says, "Go and fetch a donkey for yourself," we have to admit that the very fact that God commands it is implying that you can't steal the donkey, but must obtain it through licit means. But secondly I want to qualify this by saying that I meant it with reference only to things that we know for a fact that God has positively willed (i.e., things He has spoken about in Scripture). While we might be able to reasonably affirm that God probably directly willed the defeat of Nazi Germany, it is not something on the same level as the commands He explicitly gives in the Sacred Scriptures. We have to be careful about presuming to know what God wills outside of Divine Revelation. That being said, we come to our conundrum with Joshua: God explicitly commanding not just the removal but the killing of the Canaanites down to the last person. That's the issue with this text - God apparently commanding an end and evil means to attain it. We have already in the last post swept aside the argument that God did not really command it or that the Jews could have misinterpreted it (both of which end up denying the inspiration of Deuteronomy). This leaves us with only two possible alternatives: either God really is a sheer monster, as Richard Dawkins claimed, or else He is justified in commanding the slaughter of the Canaanites and the Israelites who participated in the slaughter are not to be held guilty of any sin. Then Joshua and all Israel with him passed on from Makkedah to Libnah and fought against Libnah. And the LORD gave it also and its king into the hand of Israel. And he struck it with the edge of the sword, and every person in it; he left none remaining in it. And he did to its kingas he had done to the king of Jericho. And Joshua passed on from Libnah, and all Israel with him, and came to Lachish... (Joshua 10:29-31). So Joshua struck the whole land, the hill country and the Negeb and the lowland and the slopes, and all their kings. He left none remaining, but devoted to destruction all that breathed, just as the LORD God of Israel commanded. And all the cities of those kings, and all their kings, Joshua captured, and struck them with the edge of the sword, devoting them to destruction, just as Moses the servant of the LORD had commanded...every man they struck with the edge of the sword until they had destroyed them, and they did not leave any who breathed. Just as the LORD had commanded Moses his servant, so Moses commanded Joshua, and so Joshua did. He left nothing undone of all that the LORD had commanded Moses...For it was the LORD’s doing to harden their hearts that they should come against Israel in battle, in order that they should be devoted to destruction and should receive no mercy but be destroyed, just as the LORD commanded Moses. This is interesting: the Latin here from the Vulgate for destroyed is perirent, which simply means to be destroyed. The RSV uses the politically-incorrect word "exterminated." God definitely was commanding the killing of the Canaanites, and no argument that claims that the Israelites misunderstood God could possibly hold water if we are to preserve inspiration. For many people this becomes a squeamish topic because there is way too much emotional connection between this idea of herem warfare in the Old Testament and actual atrocities committed in more recent times, sometimes by persons claiming to act on God's behalf. Most people think of the Crusades (though I would hotly contest that), but I would point out that the English Puritan attitude towards the Native Americans was much closer to the Israelite/Canaanite paradigm than anything we saw in the Crusades. The Puritans were wont to view themselves in Old Testament terms and saw themselves as dispossessing a new Canaanite from the Promised Land. Thus we have to strenuously declare that the example of warfare found in Joshua is not to be taken as any kind of normative prototype for Christian warfare. I think too many people are afraid that if we somehow justify the conduct of Joshua it will only be a small leap to justifying like conduct by ourselves. This is a source of considerable opposition to any vindication of Joshua or Israel here. Fear not! As with many other situations in the Old Testament, we have to recognize that ancient Israel was a kind of "special case" and that we are in no way attempting to make a connection between Israel's slaughter of the Canaanites and any type of Christian warfare. God has power over all lives and can terminate them how He wants - and in the end, doesn't He terminate every single life? Maybe we do not die in war, but we all die. Most of us recognize this fact when it comes to the Flood, Sodom and Gomorrah, etc. God can take us out any way He chooses. Ah, Assyria, the rod of my anger; the staff in their hands is my fury! Against a godless nation I send him, and against the people of my wrath I command him, to take spoil and seize plunder, and to tread them down like the mire of the streets (Isa. 10:5-6). Sharpen the arrows! Take up the shields! The LORD has stirred up the spirit of the kings of the Medes, because his purpose concerning Babylon is to destroy it, for that is the vengeance of the LORD, the vengeance for his temple. You are my hammer and weapon of war: with you I break nations in pieces; with you I destroy kingdoms; with you I break in pieces the horse and his rider; with you I break in pieces the chariot and the charioteer; with you I break in pieces man and woman; with you I break in pieces the old man and the youth;with you I break in pieces the young man and the young woman; with you I break in pieces the shepherd and his flock;with you I break in pieces the farmer and his team; with you I break in pieces governors and commanders. "I will repay Babylon and all the inhabitants of Chaldea before your very eyes for all the evil that they have done in Zion, declares the LORD (Jer. 51:11, 20-23). While the warfare mentioned above is not herem warfare, it demonstrates the concept that just as God can use natural forces to chasten peoples, sometimes He also makes use of other nations to be His "hammer and weapon of war." This is what God did with Joshua with regards to the Canaanites. Then the LORD said to Abram, "Know for certain that your offspring will be sojourners in a land that is not theirs and will be servants there, and they will be afflicted for four hundred years. But I will bring judgment on the nation that they serve, and afterward they shall come out with great possessions...and they shall come back here in the fourth generation, for the iniquity of the Amorites is not yet complete" (Gen. 15:13-14, 16). Hear, O Israel: you are to cross over the Jordan today, to go in to dispossess nations greater and mightier than yourselves, cities great and fortified up to heaven, a people great and tall...Do not say in your heart, after the LORD your God has thrust them out before you, 'It is because of my righteousness that the LORD has brought me in to possess this land,' whereas it is because of the wickedness of these nations that the LORD is driving them out before you. Not because of your righteousness or the uprightness of your heart are you going in to possess their land, but because of the wickedness of these nations the LORD your God is driving them out from before you, and that he may confirm the word that the LORD swore to your fathers, to Abraham, to Isaac, and to Jacob. Know, therefore, that the LORD your God is not giving you this good land to possess because of your righteousness, for you are a stubborn people (Deut. 9:1, 4-6). He we have it on authority of God Himself that the displacement is to occur because of the wickedness of the Amorites, which they had apparently been building up since the days of Abraham. Another interesting point is how God repeats to the Israelites three times that they are not possessing the land because of their righteousness. So it is another biblical case of God wiping out a nation or people because of their sins (like Sodom) and using another nation as His instrument to do this (like Assyria to Israel, or Media to Babylon). Really, there is nothing new here. Unless we are prepared to ask why God didn't spare the babies when He flooded the world or destroyed Sodom, we ought not to raise a similar argument here, for His power over life is complete: "See ye that I alone am, and there is no other God besides me: I will kill and I will make to live: I will strike, and I will heal, and there is none that can deliver out of my hand" (Deut. 23:29). But while we can accept the idea of God meting out this sort of punishment, we might be tempted to ask if it isn't overkill. If the Amorites were heaping up judgment for four centuries since Abraham, is it right for God to punish with death those living in Joshua's time, only one generation, one fragment of the people who made up the sum total of the Amorites since the time of Abraham? Is it right for God to judge a person for somebody else's sin? Woe to you, Chorazin! Woe to you, Bethsaida! For if the mighty works done in you had been done in Tyre and Sidon, they would have repented long ago, sitting in sackcloth and ashes. But it will be more bearable in the judgment for Tyre and Sidon than for you (Luke 10:13-14). As the crowds increased, Jesus said, "This is a wicked generation. It asks for a miraculous sign, but none will be given it except the sign of Jonah. For as Jonah was a sign to the Ninevites, so also will the Son of Man be to this generation. The Queen of the South will rise at the judgment with the men of this generation and condemn them; for she came from the ends of the earth to listen to Solomon's wisdom, and now one greater than Solomon is here. The men of Nineveh will stand up at the judgment with this generation and condemn it; for they repented at the preaching of Jonah, and now one greater than Jonah is here (Luke 10:29-32). Woe unto you! for ye build the sepulchres of the prophets, and your fathers killed them. Truly ye bear witness that ye allow the deeds of your fathers: for they indeed killed them, and ye build their sepulchres. Therefore also said the wisdom of God, I will send them prophets and apostles, and some of them they shall slay and persecute: That the blood of all the prophets, which was shed from the foundation of the world, may be required of this generation; From the blood of Abel unto the blood of Zacharias which perished between the altar and the temple: verily I say unto you, It shall be required of this generation (Luke 11:47-52). Wow! So if we are questioning if God can punish one generation of Amorites for four hundred years of sins, what are we to make of Jesus' statement that one generation of Jews shall be punished for all the blood of the prophets "shed from the foundation of the world?" This is an example of what I said last time about New Testament judgments being stricter than those of the Old Testament. So, we have established that God does punish a single generation for years of sins. But what does this punishment imply? What it does not imply is the eternal destiny of the individuals involved. Just because God wipes out a people does not mean they all go to hell. Insofar as a person's individual standing before God is concerned, then we ought not to see these judgments as any sort of condemnation regarding to eternal punishment due to sin. That is a personal matter between the person and God. But insofar as that person is part of a social group, nation or generation that God happens to be executing judgment on, then their death is seen as a judgment not on them personally but on the wicked generation. The sins of the fathers are said to be punished in their children, because the latter are the more prone to sin through being brought up amid their parents' crimes, both by becoming accustomed to them, and by imitating their parents' example, conforming to their authority as it were. Moreover they deserve heavier punishment if, seeing the punishment of their parents, they fail to mend their ways (STh I-II:87:8). Remember Sodom? God said He would spare it if Abraham could find but ten righteous persons in the city, but he was unable to find even that. This idea about perhaps the destruction of the innocent Amorites young being a mercy of God brings us to an element of Catholic social teaching that I think tends to take a backseat due to the emphasis on the right to life in the Pro-Life movement: the manner and time in which we exit our lives on this earth are not the final end nor of ultimate importance to our destiny. Sometimes God snuffing out a life when it is young is merciful if He knows it will fall into mortal sin when it reaches adulthood. Is this not the ideal behind the prayer, "Lord, let me die rather than commit a mortal sin?" This has been a long post, so I'd like to do a little recap. I think we can vindicate God of any wrongdoing in the genocide of the Amorites in these respects: first, that He is the ultimate Lord over all human life and can dispose of it as He pleases. We understand this to be the case if He uses a flood, brimstone from heaven, earthquake or some other natural means, but it is equally as true if He decides to use other humans. Second, it is common for God to use other nations as the instruments for judging a wicked people or generation. Third, that God does indeed judge persons collectively by their membership in a particular group. Fourth, that sometimes the judgment of these wicked peoples is brought down in a single generation to account for centuries of sins. Fifth, though many may die in these judgments, we ought not to see any one person's death as indicitive of their personal eternal destiny. Sixth, ultimately the manner in which we leave this earth is not of ultimate importance: God ultimately wipes out not only the Amorites, but also every single human person since everyone dies. There is only one element left, which I will take up next time: how can the Israelites who did the killing have participated in the slaughter of babies, elderly and women and not be guilty of sin? Click here for part 3 in this series. If one takes the time to read a lot of the work of the modern atheists like Richard Dawkins, one will find that a recurring assault on the veracity of Christianity comes in the form of attacks on the fierce warfare presented to us in the Old Testament Book of Joshua. In Joshua we are presented with what is legitimately one of the greatest apparent obstacles to the affirmation of an All-Loving God in the Scriptures. In Joshua, we find God not only permitting evil to be done but actually positively commanding genocidal warfare as part of His Divine Plan. Since we are obviously not going to take Dawkins' position that this somehow implies God cannot exist, nor are we going to adopt the Modernist route of denying the inspiration of this book, let's see if we can't find a satisfactory solution to this apparent difficulty. The God of the Old Testament is a sheer monster. Anyone who denies that simply hasn't read the Old Testament. In chapter two of the book, I describe him as 'a petty, unjust, unforgiving control-freak; a vindictive, bloodthirsty ethnic cleanser; a misogynistic, homophobic, racist, genocidal, capriciously malevolent bully.' I defy anybody to disagree with any of those epithets...For example, in the book of Joshua, the story of the children of Israel taking over the Promised Land has one genocide after another. Tribe after tribe are wiped out with great gore, blood and glee with direct orders from God. 'Thou shalt not kill' really means 'Thou shalt not kill another Jew' (From an interview with Metro, source). Right out of the gate we can reply to Dawkins that the question of God's goodness is different from the question of His existence. The fact (for the sake of argument) that God comes off as a "sheer monster" is irrelevant as to whether He exists or not. It could just be the fact that we are in reality stuck with a "sheer monster" for a God, as in Islam, where the rule of God is completely arbitrary and God's will is grounded in His unbounded power ("because I said so") not in His goodness. So, if God really does come off as a monster in the Old Testament, then we'd have to ask ourselves if this sufficiently disproves God's existence or if we would not rather be inclined to disbelieve what we did not like to hear about. At any rate, it is interesting that the ancients, despite being mired in paganism, were more rational about this than Dawkins. They fully acknowledged within their pantheons the existence of "evil" or capricious gods whom one would not want to have anything to do with. Yet they never disbelieved in Kali or Hades or any of the other unpleasant gods and goddesses: they simply tried to placate and avoid them. The point I am making is that (regardless of whether or not any god really exists) most people throughout history, even the pagans, understood the morality of the gods as a distinct issue from the existence of them. But we should not be satisfied with this answer alone, because we are not content to admit that God is a sheer monster, because we know Him to be a God of infinite goodness, love and mercy. Therefore, let us cast Dawkins aside and look at the text of Joshua itself and see if genocide is consonant with a loving God. But nothing that a man owns and devotes to the LORD -whether man or animal or family land—may be sold or redeemed; everything so devoted is most holy to the LORD. No person devoted to destruction may be ransomed; he must be put to death. But keep away from the devoted things, so that you will not bring about your own destruction by taking any of them. Otherwise you will make the camp of Israel liable to destruction and bring trouble on it (Joshua 6:18). When the LORD your God brings you into the land you are entering to possess and drives out before you many nations—the Hittites, Girgashites, Amorites, Canaanites, Perizzites, Hivites and Jebusites, seven nations larger and stronger than you- and when the LORD your God has delivered them over to you and you have defeated them, then you must destroy them totally. Make no treaty with them, and show them no mercy. Do not intermarry with them. Do not give your daughters to their sons or take their daughters for your sons, for they will turn your sons away from following me to serve other gods, and the LORD's anger will burn against you and will quickly destroy you. This is what you are to do to them: Break down their altars, smash their sacred stones, cut down their Asherah poles and burn their idols in the fire. For you are a people holy to the LORD your God (Deut. 7:1-6). (A) It denies the divine inspiration of Deuteronomy. These are the words of God Himself, and it should be further pointed out that they occur in the same discourse in which God gives the Ten Commandments through Moses a second time - therefore we ought to tread lightly with this passage! (B) Furthermore, the idea of some Middle Eastern tribe in the first millenium BC having such scruples about genocide that they felt panged by their conscience to insert some divine justification of it into the Sacred Books is stupid. People in that place and time had no scruples about genocidal warfare and would have carried it out with or without a decree from God. No army or nation "felt" guilty about genocide in the first millennium BC, making any sort of after-the-fact redaction a non sequitur. Let's not project our guilt-ridden, delicate 21st century politically correct consciences onto a warrior-tribe of the 12th century before Christ. Another Modernist argument against this passage is that God did not command the genocide but rather tolerated it. 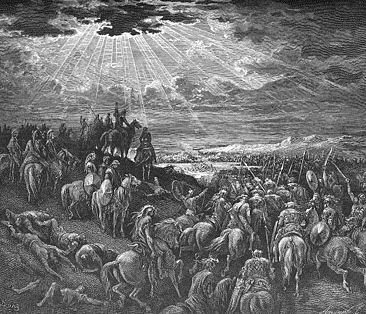 In this view, God commands the removal of the Canaanites and it is Joshua who takes it upon himself to interpret that as killing. Thus, they would argue, God can be vindicated since He did not actually command the slayings. (A) It's simply not true. God does command the herem warfare in Deuteronomy 7. Thus this argument must turn into the argument that this portion of Deuteronomy is not really inspired, which is heresy. (B) But let's put that aside for a moment and look at the issue of God allowing something that He does not actively command. A great example of this is polygamy, which God tolerates because of the "hardness of their hearts," or in other words in light of the imperfect stage of moral development of the Israelites at that time. God permits polygamy but never commands or ordains it, and as soon as men are ready for it morally it is no longer permissible. When Israel became strong, they pressed the Canaanites into forced labor but never drove them out completely...[Then] the angel of the LORD went up from Gilgal to Bokim and said, "I brought you up out of Egypt and led you into the land that I swore to give to your forefathers. I said, 'I will never break my covenant with you, and you shall not make a covenant with the people of this land, but you shall break down their altars.' Yet you have disobeyed me. Why have you done this? 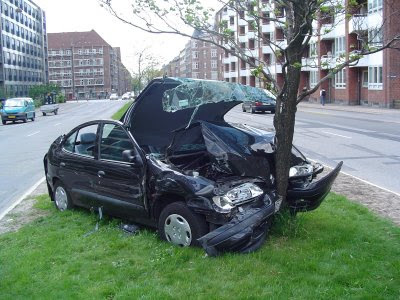 Now therefore I tell you that I will not drive them out before you; they will be thorns in your sides and their gods will be a snare to you" (Judges 1:28, 2:1-5). If God did not positively decree the extermination of the Canaanites, how could he punish the Israelites for not carrying it out? Nobody was ever punished for not entering into polygamous marriage. This is a case of God definitively commanding something, not permissively allowing it. (C) Finally we must make the moral point that if God commands the ends He also must will the means. Suppose the Modernists are right and God simply said, "Get rid of the Canaanites and take their land," and it was Joshua who assumed that God meant killing them, we have to ask the following question: What else was Joshua supposed to think? It's kind of like saying that the mafia boss is not guilty of commanding murder just because he said to "get rid" of a certain person without actually commanding a killing. In the 13th century BC in Palestine, what other conclusion was Joshua supposed to come to when God tells him to dispossess the peoples and take their land? Even if we grant that this could be true, God would still be the cause of the killings, because God would have given the command to dispossess them and would be guilty of failing to specify to Joshua how this was to be done - and furthermore, we don't see God stepping in to stop Joshua saying, "Wait! I didn't mean kill them!" But this is all a moot point, because we cannot get around the one fact that God actively commanded not just the removal but the killing of the Canannites. Remember Deuteronomy 7: "When the LORD your God has delivered them over to you and you have defeated them, then you must destroy them totally. Make no treaty with them, and show them no mercy." If "show them no mercy" means anything other than "kill them", then we still have to judge God guilty of being the worst communicator in history. No, there is no way around the fact that God commanded genocide. So other than trying to use Modernistic legerdemain to get rid of problematic verses, let's actually look at what occurs in Joshua, admit it was God's command and see where we can go from there. That's where we'll start next time. Click here for part 2 in this series. I just got back from a really great Youth Group meeting. I did a topic night on Vatican Current Events. 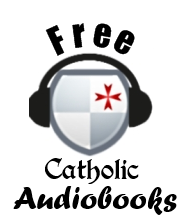 We looked at several controversial statements of Pope Benedict XVI from the past several years of his pontificate and examined the difference between how they were reported in the media versus what was actually said in the document. I had 22 kids show up, lively participation, true engagement and lots of great questions which demonstrated that (a) they actually knew and cared about what was being discussed, and (b) were making the necessary logical connections in their head to see the implications of what was being discussed and ask questions about it. We talked about Cardinal Ratzinger's homily at the papal conclave (the "dictatorship of relatavism" speech), the Regensburg Address, some pertinent phrases from Summorum Pontificum (especially the clause from the intro letter that says that what was once considered sacred cannot ever be considered harmful), and finally discussed the lifting of the SSPX excommunications. It led into a fruitful discussion on obedience, when to disobey and unjust law, and many more questions that only teens could draw out of a topic. I realize that kids are not stupid and treat them accordingly. Teens are some of the brightest, most enterprising people you'll ever meet. They have wonderfully creative ideas if you'd just stop to listen to them. They ask very pertinent questions and are able to grasp complicated ideas if you take the time to walk them through it. When I became Youth Director, I decided that I was going to give these kids the truth no matter what - not a dumbed down truth, not a sappy Youth Group experience focused on a slew of shallow service projects - but a Youth Group where there was serious intellectual growth coupled with true spiritual formation. That's what Youth Group should be: a place where kids learn how to be adult Catholics. Not where their petty teenage idiosyncracies are coddled and spoiled. When Youth Group is done well, it gives rise to an interesting dynamic: the kids grow in maturity and become more adultlike, and I feel renewed in my strength and get a little bit of my fleeting youth back. Anyhow, I am just excited and very proud of my Youth Group kids that show up and participate so enthusiastically when the topic night is "Vatican Current Events" and who willingly read excerpts from Regensburg and the motu proprio. Kids are wonderful if you'd realize that they are not stupid and treat them as little adults, just as you would like to be treated. In this light, I am curious to hear from you all: what are some horror stories you have heard from other Youth Groups? What are some things you think Youth Apostolate should include? What do you think about the way popular culture approaches the teenage demographic in general? ...In order that we may be mindful of the uncertainty of the time at which the Lord shall come to judge-whether it be at our death or at the end of the world-nothing is more frequently repeated in the Holy Scriptures than the word watch, and also the comparison of the theif, who comes when he is least expected...Nothing more useful occurs to me than for us frequently and seriously to examine our consciences, so that we may prepare for death. All Catholics, when they are about to confess their sins, do not fail to examine their conscience beforehand...there are hardly any Catholics who, when near death, do not confess their sins. Besides being a great little treatise on preparation for death, I wanted to use this excerpt to point out the traditional understanding of a sudden death as a misfortune. There used to be a traditional prayer in which one pleads with God to not be taken in death unexpectedly: "Thy hands, O Redeemer! have wholly made and formed me: ah! 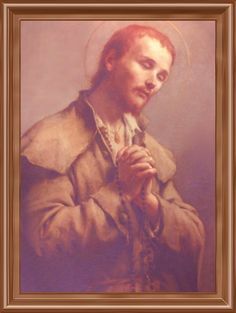 suffer not death to take me unawares; give me, I beseech Thee, time for penance; vouchsafe that I may pass from this life happily in Thy grace, that I may love Thee with my whole heart, and praise and bless Thee forever and ever" (click here for the whole prayer). I have noticed, however, that nowadays many people seem to think that a sudden death means the person automatically is saved, and this especially pertains to cases where the manner of death is particularly tragic, like a school shooting, plane crash or space shuttle explosion. I think of all the eulogies of the people who died in 9/11 or other like tragedies, how many spoke of them, as if they went right to heaven. This happens at Catholic funerals all the time, of course, but in cases where there is a sudden and tragic death, people almost seem to think that the tragic nature of the death itself is somehow what merits heaven for the person. Now I know it would be insensitive to go around right after 9/11 saying, "Yeah, but some of those people probably died in mortal sin you know..." I don't know that, and I'm not going to make that judgment. But neither am I going to take the American default position of, "It's so sad, but they went on to a better place." Oh really? How do we know that? Just because they died tragically? I think the implicit idea is that there is a debt of justice on God's part: since these people were taken away prematurely under such tragic circumstances, God owes it to them to bring them to heaven. As if simply being killed were an act of virtue. As if God has to apologize or explain or make up for the way He chooses to bring us out of this world. Perhaps this is a perversion of idea that a martyr goes straight to heaven - but in that case, it is not the fact that the martyr suffered physical death that merits even (everybody suffers physical death) but that they suffered death because of the faith. It is the adherence to the faith, the willingness to lay down one's life for Christ that makes the death of the martyr meritorious, not the simple fact of their being killed. "Oh, it's so sad Sebastian got shot up with arrows - that's so tragic! But, I'm sure he's in a better place." Yes - but not because he got shot up with arrows, but because he loved Christ and gave himself for Him. At that very time there were some present who told him about the Galileans whose blood Pilate had mingled with their sacrifices. He asked them, ‘Do you think that because these Galileans suffered in this way they were worse sinners than all other Galileans? No, I tell you; but unless you repent, you will all perish as they did. Or those eighteen who were killed when the tower of Siloam fell on them—do you think that they were worse offenders than all the others living in Jerusalem? No, I tell you; but unless you repent, you will all perish just as they did' (Luke 13:1-5). The temptation of the disciples was to think that just because a temporal calamity befell some (like a tower collapsing on them) that they were under God's condemnation: "worse sinners" than others. Christ tells us that the manner in which they exist this world has nothing to do with how sinful they were, but is due to the inscrutable Providence of God. Instead (and I think this must have been shocking to the first listeners), he warns them not to think on why they perished but on why they don't all perish. This seems to be the best response when calamity strikes: not "Why them? Why so tragically?" but "Why not me?" God can dispose of us any way He chooses and nobody is guaranteed an easy end. That is why we ought neither to presume people who die tragically get a free pass by virtue of their pitiful end, nor think that people who die in such ways are under God's judgment. We ought to do as Christ says in leaving these things to God's unknowable will, and in the meantime understand that a sudden death is not desirable - but that since, as Bellarmine says, a sudden death is very possible for any of us, we ought to always have it before us and be prepared.